Its always a problem for bloggers to get Dofollow backlinks because there are only a few websites and blogs that allow dofollow backlinks. So bloggers usually start guest blogging which is a great way to get dofollow backlinks. But the problem is not everyone can guest blog and there are not too many blogs and website which allow or accept guest posts. So I brought you lists of social networks and online directories where you can submit your website or blog links and ultimately improve your blog or site rank within a week. Remember that there is no way to get thousands of backlinks with good page rank in a minute or in an hour, so you need to submit your site to all the directories and social networks manually and one by one. Though, if you want you can submit your site or blog to about +30 directories and all domains of Google bu using Link Submitter in our SEO TOOLS. If any link is not working, please help me know. 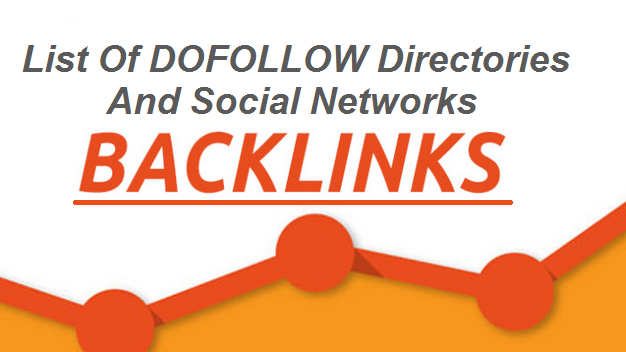 If you know about any directory or social network which provide dofollow backlinks then please let me know. I hope you like this post and found it helpful. Share it with your friends! Thank for your posting guy, i will check it soon. do you always submit your urls to all these directories ? Thanks for such a good do follow directories.